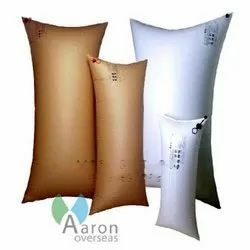 Pioneers in the industry, we offer dunnage air bag, container airbags, dunnage bags, dunnage air bags manufacturer, pp dunnage bag and paper dunnage air bags from India. Dunnage Air Bag provide an efficient load securing solution for cargo that is transported in large shipping vessels, by train or by heavy good's vehicles. 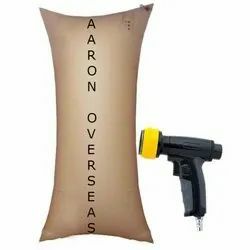 The Dunnage Air Bag is easy to use, fast inflation and deflation, can be re-used and come with a fixed connection at the valve. 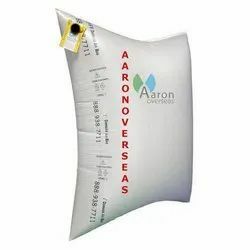 Container Airbags can protect cargoes effectively during most types of transportation via filling voids, bracing cargoes, absorbing vibration, avoiding cargoes sliding & impacts. These dunnage bags are filled with air from a compressor and set in place between products and pallets to fill the void between them. Filling this void with Dunnage Bags stops the product moving and potentially getting damaged in transit. 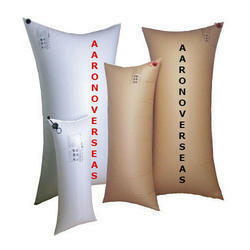 Dunnage air bags come in a variety of sizes and can be small or up to 2 meters in height. They provide excellent product protection and padding, preventing your goods from taking damage in transit. Best of all, they can be reused. Simply deflate at the end of the transit and reinflate as and when you need product protection. Dunnage Bags are a quick and easy solution to fill voids that can create load shift risks in containers/transport vehicles. Valuable cargo if not packed correctly can move in transit causing damage. Even minor damage can affect product viability, and impact on presentation. By using Dunnage bags you can fill any voids inside the container to stop the cargo moving during transit. They are easy to position and fast to inflate. They have a high resistance against punctures And are moisture resistant. Easy to remove at destination Made from 100% recyclable materials.to stop the cargo moving during transit. They are easy to position and fast to inflate. They are even water resistant! Dunnage bags offer unparalleled performance in securing loads during transportation, as they accurately fill void spaces, therefore reducing the risk of damage. Commonly used in containers, trains and ships, our easy-to-use, Kwik Fill dunnage airbags inflate in seconds using a simple, yet effective 'Turbo Flow' air gun to fill awkward voids between your products, preventing loads from shifting or falling during transportation. PP Woven Dunnage Bags assist in minimising damage caused by movement in transit. Strong and robust, made from LLDPE Bladder and Layers of PP Woven. Fit into gaps between cargo to “Fill the Void”, protecting cargo from transport movement and the resultant damage. 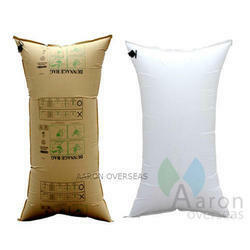 Dunnage bags operate like large air pillows and are inflated in position to maximise effectiveness. Dunnage Bags are used to secure and stabilize pallets during shipment by filling the voids in-between the loads to reduce pallet movement. Whether you transport your products via truck, railcar, sea container, vessels or a combination of these, our dunnage bags are the most effective method available to protect your goods. 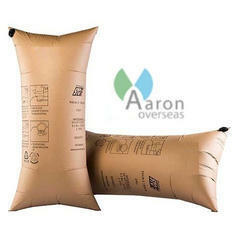 Looking for Air Dunnage Bags ?